BoBrův Spomocník: Technology and teachers: What stage of adoption have we reached? Technology and teachers: What stage of adoption have we reached? This paper serves as a reflection of current situation in the field of educational technology and an introduction to conference proceedings made by the conference organizer. It is dedicated mainly to the application of technology in schools in Europe. It addresses the problems in the area of integration of technology to everyday life of teachers. The models of this adoption are discussed, the various positions of different European countries are mentioned and the necessity of certain level of European school system integration is recognized. This requirement is viewed as a condition for larger expansion of transnational educational projects, in which we are particularly interested. Given proposition is based mainly on the results of the newest already finished IEA research SITES (The Second Information Technology in Education Study) Module 2 . The author was involved as a national coordinator. I am sure that every teacher has his/her own particular opinion how to use computers in the classroom. Naturally, this opinion is not constant, it develops continuously. This innovative process is influenced by the level of diffusion of technology to schools, by the technical development of technology itself, and by the ability of the teachers to realize the appropriate implementation. The results of the current research show that the last factor – teachers – is most important. As we wish to influence this process in some way we have to know as much as possible how it works. There are two main differences between the general adoption of some new invention and the process of technology integration by teachers. First, teachers have only a little space for making their own decision. Although they know that the use of technology is the necessity for prospective survival in the job. Second, the final stage – adoption – is impossible to be explicitly defined in this case. Innovation of education initiated by technology is different then e.g. the adoption of mobile phones. Modern educational technology is able to fulfill many different tasks. It helps teachers to enhance very different procedures. It is possible to say that the final stage of the adoption of modern technology by teachers could make for a subject for further study. The above mentioned models show the significant necessity of creating something new in the final stages of adoption. The terms as Renewal, Reorientation or simply Innovation mean that the implementation of technology is not only the process of integration of computers into the given curriculum. The great power of technology, which strengthens teachers, forces them also to make changes in the enrooted habits – to use new innovative methodology. I am sure that we all know what to imagine under the term “innovative methods”. Our projects belong to the most progressive innovative school activities. The results of the SITES research seem to support our point of view on the necessity of the project work. Its aim was to find and describe the innovative pedagogical practices in using the technology in 28 countries around the world on qualitative basis. There were the 174 cases nominated by the national research boards, for which the case studies were developed and published. As they are fully accessible on the Internet (http://sitesm2.org/sitesm2_search/), they could serve for further research of professionals and as a source of inspiration for teachers. The analysis of all studies shows that the most frequently recognized innovative school activity is collaboration of students with others in their own classes (referenced by 83% of the cases). On the second place is the search for information (74%). Very often Web as a resource (71%) and Email (68%) are used. Students create products (61%), conduct research (39%) and solve problems (33%). What is especially important for the topic of our conference is the fact that the SITES research recognized only 26% of cases, where students collaborated with outside actors included other students in the remote class. The final SITES M2 report considers this finding as a surprise and something what would be changed. This is probably the task for us. The importance of this task is even higher in the current stage of European integration, where the direct contacts among the students represent the easiest way how to increase the common European integrity and awareness. The direct “face to face” contacts are always better, but they are too expensive. So, we have to suffice mainly with the online Internet cooperation. The full description of all categories couldn’t fit to the article of this purpose and size. You can find it in my book “The Role of Internet in Education” , which is fully on disposal on the Internet. The requirement of the higher involvement of the international projects in school activities leads us to closer investigation of the necessary conditions for such progress. We can identify several important factors: technology saturation, teachers’ preparation, educational system support. The first one is so evident that we don’t need to discuss it in detail. Don’t forget only the fact that there is something like a critical mass of ICT required within a school for successful adoption of innovative approach . The critical level is determined somewhere around the ratio of 5 students per 1 computer at school today. The appropriate equipment for all teachers ready for using the technology is obvious. According to Fishman and Pinkard  head-teachers should avoid so-called “false equity” in which technology is either centralized in one place or donated to every teacher to minimize staff conflict. Rather, resources should be allocated in a way that is most likely to accomplish the vision of innovation. The second factor – teachers – is much more important. This factor is somehow connected to the first one. Reaching the critical mass of technology is the essential condition for creating a culture of innovation in school. But this condition is insufficient. Similar to critical mass of technology there is also a critical mass of practising teachers . To fulfil the first condition is relatively very easy in comparison to the second one. Teachers are very conservative and don’t like to change the procedures they have developed for years. There is a significant danger that given technology could be used only as a support for traditional instructive methods (electronic textbooks, drill and practice, testing etc.). The adoption of the real innovative approach could be done only in team through cooperation with colleagues. The head-teacher has usually the leading role. The general recommendation on the implementation of changes is to proceed with the school development plan that would include a special chapter dedicated to technology and its place in curriculum. In this way the vision of a modern school could be realized. The technology adoption is easier for teachers living in such an environment where the constructive methodology as e.g. 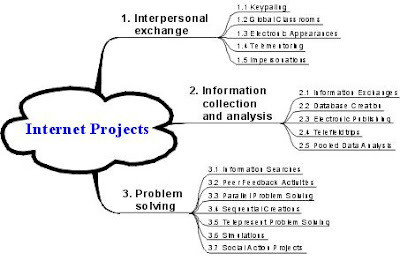 projects has been already used for a long time even without technology. For example, so-called “experimental” schools have been realizing project methods for more than hundred years. It is possible to say that the schools from European countries with the former protestant history are much closer to the constructive approach in contrast to schools from the former catholic block, where the word “instruction” has its original meaning until now. The Czech Republic could serve as an example. The situation is even worse thanks to former period of totality. These facts have a big impact on the compatibility of school systems of all European countries. Although some changes in the system are someway implemented everywhere, the stage of the reform is very different. In several countries any official support for international projects doesn’t exist. Everywhere the process of current reform of education has the same direction – from instructive approach to constructive one. Unfortunately in some states this reform is still on the beginning. The realization of transnational projects is accompanied with serious obstacles there. It is difficult to find space in regular school hours; the curriculum is described very precisely, school managements don’t support any innovations, parents have the only one wish – to prepare children for higher school entry exams. Obviously, the teachers working in these conditions have serious problems to cooperate on projects with such schools that fully support innovative methods. The Comenius project has a big credit in this field. Even if the school systems of EU countries remain independent, the Comenius support to international project work slowly helps to change mainly the traditional systems. The head-teachers can’t refuse the financial source for school on the beginning, later the online cooperation and face to face meetings give teachers the possibility to meet new methods and finally the innovation would be adopted by all the national school systems in Europe. Maybe even more official recommendations for harmonization of the conditions, in which international projects in EU are realized, would be implemented in the future. The Czech Republic could serve as an example here. Even if the number of visionary teachers is not so high and the dominant praxis in schools is very traditional, we can recognize several indicators for change in Czech educational system last years. The first significant step in the right direction was made in 2001 when the White paper “National Programme for the Development of Education in the Czech Republic” (http://www.msmt.cz/files/pdf/whitepaper.pdf) was published by the Ministry of Education. Although this document contains only recommendations and it is not obligatory, it is viewed as a basis for future development. The main ideas, which are someway related to project methods, are: reduction of prevailing encyclopedic knowledge, inclusion of gifted students and students with special needs, second language education beginning at the third grade, and support for international cooperation. These days this initiative culminates by the finalization of new complex law concerning the education. This law includes also new types of examination guaranteed by state and so called General Educational Programme for all types of school. This Programme requires preparation of autonomous curriculum and a plan of development by each of the schools. In other words, the schools get freedom to realize any kind of activities they wish. Unfortunately this freedom gives also the possibility to stick to the traditional teaching methods. We have to hope that innovative methods become widely spread in Czech education. What is the best way of adoption? One of the side findings of the SITES research is the confirmation of already known acquaintance that the main way how the new methods of the use of technology are promoted is not the study of books or Internet sources but the direct over-handing through the personal contacts among teachers. This could be done on the meetings at schools, through the observation of the colleagues in the class, or at specialized lectures, etc. Definitely, an excellent opportunity for promoting the new ideas are social events like our conference. Let’s start Bridging the Visions for Learning! 8. ROGERS, E. M. Diffusion of innovations. New York : The Free Press, 1995. ISBN: 0029266718.